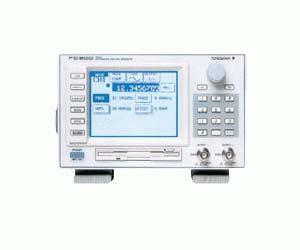 The FG200 Series function generators feature sweep and modulation capabilities with outstanding ease of operation. The FG300 Series adds arbitrary sweep and simple arbitrary waveform definition capabilities, plus sequencing functions, giving you high performancealong with ease of use. Amplitude and Duty Cycle Continuously Variable With the FG200 & FG300 Series, the output signal is not disrupted even if you continuously vary a parameter such as frequency, phase, amplitude, offset voltage, or duty cycle. Duty cycle setting range is 0% to 100%, with 0.01% resolution. With these instruments you can sweep not only frequency, but also other parameters as well, such as phase, amplitude, offset voltage, or duty cycle, with linear, log, linear step, log step, or arbitrary (FG310/FG320) sweep patterns. You can even sweep frequency and amplitude at the same time. Modulation capabilities include not only AM/FM, but also DSBAM, phase modulation (PM), offset modulation, and PWM.The modulation waveform can be sine or triangle (with variable symmetry), pulse, (with variable duty cycle), or an arbitrary userdefined waveform (FG310/FG320). The FG320 has 2 output channels. The powerful sweep and modulation capabilities of these instruments make them ideal for applications in mechatronics, and vehicle design and testing.